You may heard that it’s important to visit your dentist about twice a year, or once every six years, to maintain good oral health. 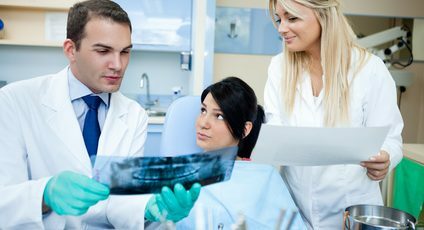 Some dentists will advocate for more or less frequent visits, depending on your current dental health. Perhaps you’ve been tempted to skip a visit or two, either due to financial or time constraints. But just how harmful is it to miss those cleanings? We would like to encourage all of our patients to maintain regular visits for a dental exam and cleaning. No matter how good a job of brushing and flossing you’re doing at home, plaque and tartar can build up. In fact, plaque can form within twelve hours of brushing. Tartar is the result of plaque that has been left on your teeth, which interacts with minerals and saliva to form a hard, calcified layer. Tartar can only be removed by a dentist with professional instruments during a cleaning. Plaque and tartar can also build up below the gumline, and in other areas that are hard to reach by brushing and flossing alone. The sooner this buildup is removed, the less chance that gingivitis will have a chance to form. Gingivitis often has silent symptoms in its earliest stages. However, your dentist will be able to tell if you are beginning to develop gingivitis. Gingivitis, if left untreated,can precede gum disease, which is more complicated to treat and can lead to swelling, inflammation or even tooth loss. In fact, most dental issues, such as cavities, are best treated when caught early on. In addition to preventing plaque and tartar buildup, decay, gingivitis and gum disease, at each cleaning and check up your dentist will screen you for oral cancer. Many lives have been saved by the early detection of oral cancer, as it is most successfully treated in its earliest stages. Your dentist has equipment to detect any abnormalities. Most insurance providers will cover at least one dental visit a year for a cleaning and checkup. We can help you understand your insurance plan to ensure that you get the most our of your benefits. At any rate, it’s not a good idea to let your insurance plan dictate how often you visit the dentist. Think of visiting your dentist twice a year as an investment in your health and overall wellbeing.